"I'm not the strongest so I gotta come up with other ways to win." Toms Skujins was not supposed to win Tuesday’s Tre Valli Varesine race in Italy. Skujins wasn’t the strongest rider in the lineup; Alejandro Valverde was there, as were Thibaut Pinot, Miguel Ángel López, and other stars looking to test their legs before Saturday’s Tour of Lombardy. 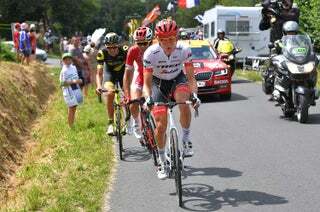 Even after Skujins attacked his way into the front group, the odds were not in his favor. On paper, breakaway companion Peter Kennaugh had the finish, and EF Education First carried a numerical advantage with both Mike Woods and Colombian star Rigoberto Urán. And yet, as he often does, Tom Skujins somehow wrestled victory away from the others. The Trek-Segafredo rider opened his sprint first and blew past Urán. His acceleration from 200 meters caught Kennaugh off guard, and he sailed across the line with enough time to pump his fist. A few hours after his win, I gave Skujins a call. He agreed that his victory defied logic. We’ve written about Toms Skujins before and marveled at his preternatural ability to score dramatic victories through a combination of luck, timing, and gutsy, never-say-die attacks. His breakthrough victory at the 2015 Amgen Tour of California came after an unrelenting attack. His stage win at California this year came after the peloton nearly chased him down; a last ditch surge earned him a narrow victory. Even Tuesday’s win had its roots in Skujins’s aggressive style. He initially attacked alongside Mathias Frank and Rob Power; after a larger group caught the three, Skujins could have easily faded back to the peloton. Attack over, job done, time for some rest. Instead, Skujins attacked again into a different group; the move set him up for victory. This was Skujins’s fourth victory of 2018, a monumental number for a rider who must scrap and fight for each opportunity. Sure, Skujins has natural gifts that place him within the top echelon of endurance athletes. But within the tiny population of uber-talented WorldTour riders, Skujins is nowhere near the top. And he is the first to acknowledge the limitations of his legs and his lungs. And there is another hurdle that stands in the way of Toms Skujins, something that holds most of us back at some point in our respective careers and life ambitions. Skujns operates within a regimented hierarchy, where each individual knows his or her place. In pro cycling the stars win races and riders like Toms Skujins do work. On most days Skujins is a worker bee, a cog in much larger machine that is engineered for a greater cause. Skujins plays his role. During the Tour de France’s ninth stage he shut down early gaps and then helped propel Jasper Stuyven’s crucial attack that set up John Degenkolb’s stage victory. On other stages he carried bottles for Bauke Mollema and emptied his legs to keep Mollema within the peloton. Sometimes Skujins’s job is to hop into the early breakaway. Other days, it’s to rest. A few times a year, however, Toms Skujins is given the chance to win. Perhaps it’s during a weeklong stage race or at smaller one-day events like the Challenge Mallorca or Tre Valli Varesini. In those situations Skujins always makes the most out of the opportunity. He doesn’t always win: at this year’s Colorado Classic he came painfully close to a stage win, only to be caught just before the line. Buried somewhere in Skujins’s logic is life advice that might fit nicely on one of those inspirational posters that hang in your dentists’s waiting room. Something about missing all of the shots you don’t take, or how a ship in port is safe, but that’s not what ships or made for. Yeah, you know posters. I hate those things. Rather than rattle off some motivational quote, I will leave you all with a final Skujinism to, perhaps, inspire you to take your own dramatic win. My advice: Be like Toms Skujins and find your happy place.